What's in a name? A lot, if the name to bank upon is Atal Bihari Vajpayee in this assembly constituency of Chhattisgarh where Chief Minister Raman Singh of the BJP is pitted against Congress candidate Karuna Shukla, niece of the late former prime minister. Both the parties are trying their best to garner votes in Vajpayee's name. While the ruling party leaders say the BJP and Vajpayee are "synonymous", Shukla alleged the chief minister was showing his "double standards" by claiming to follow the ideology of the BJP stalwart when the state government was "miles apart" from the former prime minister's teachings. "BJP has changed its 'chaal, charitra aur chehra' (ways, character and face). It is no more a party envisaged by Atal ji and (Lal Krishna) Advani ji and people of the state know this," Shukla told PTI on her campaign trail. "There is no question of denying that I am Atal ji's niece. His teachings and courage are in my blood. I am guided by his principles. People in Rajnandgaon know that I will implement the model of good governance in the corruption-riddled state if the Congress wins the election," said Shukla, a former BJP central office-bearer who quit the party in 2013 after over three decades of association. She joined the Congress in February 2014 and unsuccessfully fought the Lok Sabha elections from the state's Bilaspur seat on the party ticket. As a BJP leader, she had won the Lok Sabha elections from Janjgir in 2004, but lost in 2009 from Korba. The Congress has now fielded her from Rajnandgaon, the chief minister's home turf. "Raman Singh calls me his sister. He claims that he is following the ideology of Atal Bihari Vajpayee. As far as I know this (state) government is miles apart from Atal ji's teaching. It is his (CM's) double standard," Shukla alleged. "It is a sorry state of affairs in Rajnandgaon where people face scarcity of water and access to other necessities. Corruption is rampant in the administration. People will root out this corrupt government this time from the state," she said. She exuded confidence that the Congress will form government in the state after winning the elections. Singh has been the state's chief minister for nearly 15 years with his party managing to keep the Congress away from the government for three consecutive assembly elections. 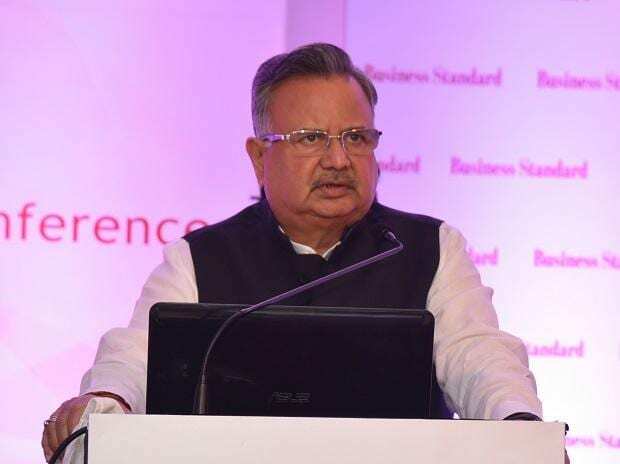 Rejecting Shukla's allegations, the BJP leaders said the people of Rajnandgaon are seeing development done by the chief minister Raman Singh and his government and that the BJP will win the seat with record margin this time. "Karuna ji had left BJP to join Congress. People know this very well. She will not present any challenge for Raman Singh who will win the polls with the record margin of votes, said Sanjay Shrivastava, a senior BJP leader of the state. The BJP has projected the election in Singh's home constituency as a fight between a local and an outsider. "How can they expect somebody who is not from their area to work from them. People in Rajnandgaon have full faith in Raman Singh and it will be proved after the voting on November 12, Shrivastava said. "BJP is seeking votes by citing its good governance and development model which people of the state have been witnessing. All leaders of the party including Atal Ji and their legacy is certainly part of the part campaign," another senior BJP leader said. The chief minister's son Abhishek Singh is the sitting MP from Rajnandgaon Lok Sabha constituency. The six assembly seats under Rajnandgaon district, including the one from which the chief minister is fighting, will go to polls on November 12. Voting will take place for a total of 18 seats on the date, while the remaining 72 seats will go to polls in the second phase on November 20. The counting for all 90 seats will take place on December 11, along with the same for the four other states -- neighbouring Madhya Pradesh, Telangana, Rajasthan and Mizoram. Another key factor in the state elections this time is former chief minister Ajit Jogi's Janata Congress Chhattisgarh (JCC), who has joined hands with Mayawati's Bahujan Samaj Party. First Jogi was being seen as giving a direct fight to Singh from Rajnandgaon constituency, but later he nominated a a local corporation. Pundits say Jogi himself could have given Singh a good fight given a strong presence of voters from his caste base of Mahars and Satnamis.